I have been busy getting my art marketing organized and updated. My website has been spiffed up and it is a lot easier to buy the small paintings I have for sale. The blog is next! If you would like to take a look at my website click here or on the link on the blog. In the precious few moments between during the challenge and working on my website, I also did a bit of art studies. I had mentioned Frederick Judd Waugh on a recent post and posted one of his beautiful seascapes. I have been digging deeper to find more information about this artist. I came across a mention of a Walter Foster book published in 1969. I went on a search and found a copy on eBay for $4.95! No buy now button so I patiently waited out the week and put a bid on it the last hour or so and now the book is mine. The book contains 60 full color reproductions of his work from the Ulrich collection, which I believe, has since been dismantled and sold here and there. Knowing that color printing processes in 1969 were no where near to what they are today, I didn't have tremendous expectations but, they aren't too bad. Not all of these paintings are online. I thought I would show some of the paintings I like now and then so here are a couple, starting with the front of the book. I don't intend to share all 60 of the paintings. They appear to be from the entire span of his career as some look like they were painted earlier in his career. 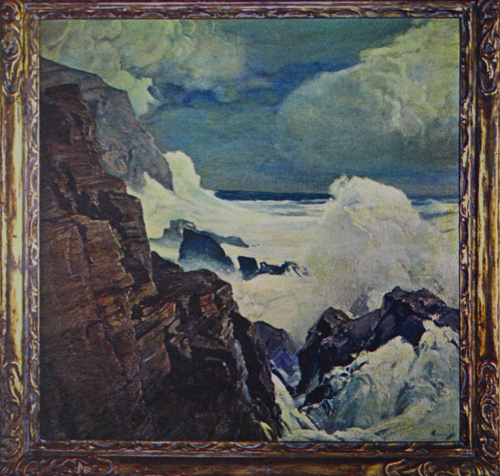 I like his later paintings. They have stunning detail and color and they inspire me tremendously. Here are two paintings from the book that I liked. 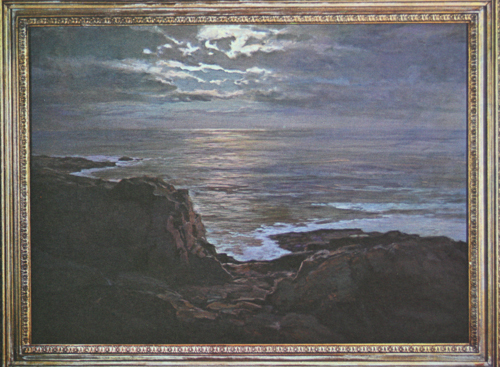 Evening, by Frederick J. Waugh, 25"x30"
Great Sea to Headland, by Frederick J. Waugh, 31"x31"
You have to remember that these are photos of printed color reproductions from 1969. I know that much of the subtle color in these paintings are lost. One day I will have to go on a pilgrimage and visit every Frederick Waugh seascape available for viewing. 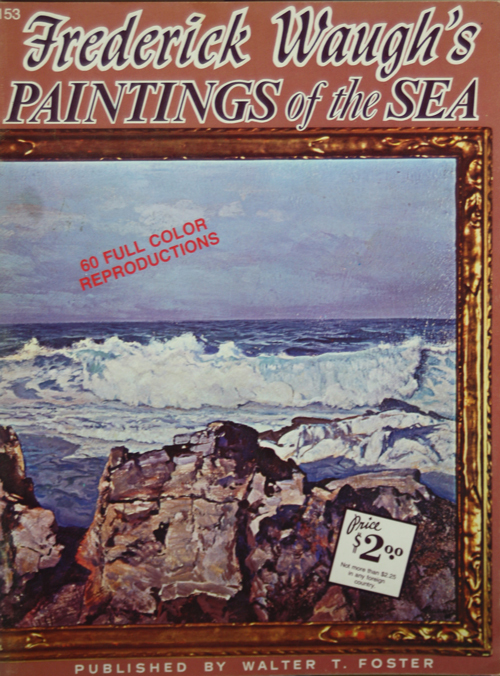 It would be nice if some current art historian could pull together a proper book on his works. For some reason they decided to print the photos of these paintings showing their frames. It isn't an effect I like. I was thrilled when this arrived in yesterday's mail. It will be a wonderful resource and source of inspiration. I am hoping that tomorrow I will be starting in on revamping my blog. I want to make it so that a person can purchase a painting from here too if they find something they love. Please do check out my website. I am adding a painting for sale every day this week. If you wish to leave any feedback, feel free to leave a comment on this post.